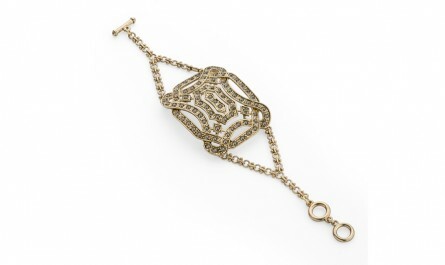 Wedding Wednesday Quick Post – Trending: the Statement Bracelet for brides. Brides come to us for the following reasons: a) they have no time, b) they are stressed, c) they hold demanding jobs and volunteer work, d) they live out of town, e) they are planning a destination wedding (aren’t they all at this point?). One common misconception is that said brides need style guidance, but that is simply not true. Our brides are chic, stylish and most of all, entirely unique. So, when we hold forth about trends or kick a glaringly tacky one to the curb, it is not a reflection on the part of our clients – ever. This is a teaser for the larger “What’s In? What’s Out?” wedding post that is coming soon. Very often, I’ll see a bride with way too much going on, accessory-wise. Not my brides. But if you are planning a wedding and here on this blog, let me just say that tweaking the expected and editing down your look is key. Tiaras=no. Unless you are 4 years old. If you are 35 and wearing a tiara and you are not royalty, it’s just jejeune. Updo with curlicued tendrils PLUS a statement necklace PLUS too much makeup PLUS giant briolette earrings? No. Just. No. This season, I am hoping brides will wear their hair long and loose, keeping the neckline clean and focus on the arm candy. That’s right – the Statement Bracelet! All eyes will be on your hands anyway, so give it a little more attention! So many companies are doing links, cuffs, skins, stones, estate, antique, costume, real, coloured stones, yellow gold, white gold, rose gold (! ), Deco, tribal, or old-Hollywood glam that it gives you a great chance to show off the long-overlooked and most lovely wrist. Generally speaking, worn on the opposite hand of your engagement and wedding rings. There are so many wedding possibilities, in all shapes, sizes and budgets, so let’s do an overview, shall we? J. Crew (bow down to Jenna Lyons) is rife with possibilities. 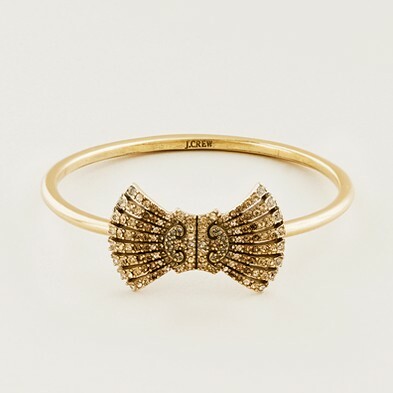 I love the Deco Bow Bangle. I also favour the Classic Pave Link Bracelet (and own it!). So wedding-ready is the Crystal Mosaic Bracelet – it’s got that weight and heft to it. Pair ANY of these with the Crystal Sunburst Earrings and you have a total look with glossy hair and a great manicure! These also make insanely great bridesmaids’ gifts. Moving on to my favourite jewelers – the real stuff, at a good price – are ALL of the bracelets (except the leather ones) from J. L. Rocks! Check out the page and images here! Have you seen JewelMint, a carefully curated lookbook of wonderful pieces at $29.99 cofounded by actress Kate Bosworth and stylist Cher Coulter? It’s like ShoeDazzle or The Row for jewelry and it’s quite beautiful. 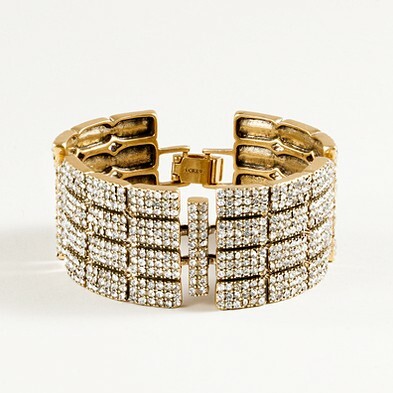 I have a crush on the Savoy bracelet (above)! Big spender? 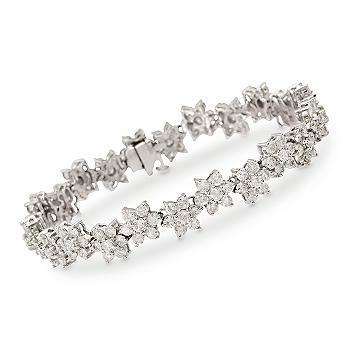 Look no further than this diamond flower bracelet from Ross-Simons, who, by the way, has lovely CZ versions of their important pieces. I also love love Emitations, an online retailer that cultivates great red carpet looks for less. Chances are, you can find a faux copy of your engagement and wedding rings to wear while, say, scuba-diving. Their marketing director, Jenni Beckstrom, is all kinds of awesome, to boot! Of course, who doesn’t love the Trinity and Love bracelets from Cartier? Check them out online! In yellow gold, rose gold, white gold, with or without diamonds. True love! Posted in fabulous, jewelry, parties, Uncategorized, weddings and tagged bracelets, cheap thrills, J Crew, new and fun, trending, Wedding Jewels, weddings. Bookmark the permalink.